It was one of the great anti-climaxes in the history of world curling. That’s if you rate the World Financial Group Continental Cup as a serious competition, in a league with world championships and Olympic Games. Kevin Martin’s Edmonton team, anchoring Team North America, took advantage when Norway’s Thomas Ulsrud missed a nose-double with his last rock of the seventh end and yielded the gift of a 35-point skin and an additional $13,000 Cdn, which capped the biggest blowout in the history of the event. The final count, once the eighth and final skin was settled, read Team North America 298, Team World 102. The previous record difference was established at Medicine Hat in 2007 when the Amerks thrashed the visitors 290-110. The 26 members (24 players plus captain and coach) of the winning team divvied up $65,000 Cdn. The losing World teammates shared $26,000 Cdn. 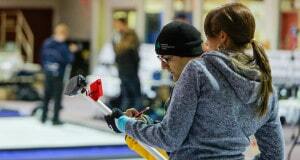 Canadian Curling Association manager Warren Hansen of Port Coquitlam, B.C. attempted Sunday to put the event in a different perspective. Sure, it’s patterned after the Ryder Cup of golf, he admits. But perhaps that analogy is far too grandiose, based on the less-than-precocious state of the game in most countries other than Canada. “Look at it more like curling’s all-star week,” he says, alluding to the annual promotions of pro hockey, pro basketball and pro baseball. In terms of talent, this was, indeed, an all-star week. Chock full of Olympians and world champions. In fact, the field of competitors offered nothing but Olympians and world champions. The trend was reflected again Sunday with Martin’s final men’s decision. Earlier in the day, Cheryl Bernard’s Olympic silver medallists rolled past bronze medallist Bingyu Wang of China 42-13. Ulsrud and Martin traded four-point skins at the outset, Martin’s in the second end set up by a runback double-kill from second player Marc Kennedy. The subsequent four skins wound up carried over, setting up the 35-point seventh that appeared to be headed Norway’s way until Martin executed a raise to the four-foot and Ulsrud failed to drive the Martin shooter on the raise stone and spill both. Ulsrud banged a cluster of rocks to force the third-skin carryover. Following a rare blank for the fourth carryover, Ulsrud narrowly missed an angle-raise double to settle for the fifth carryover. Martin rolled his last shooter too far on a tap leaving the sixth carryover. The Norwegian skip executed as routine hit to score a deuce and claim the final eighth skin worth 12 points. “We had our chances. 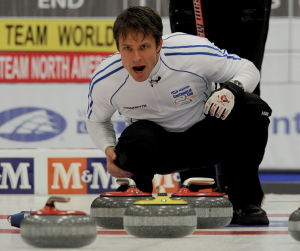 He had his chances,” said Ulsrud. He was questioned about a decision to show up for the opening parade into the arena wearing Norway’s controversial collection of psychedelic trousers. Martin lauded the St. Albert organizing committee. “It looks good on them,” said the Olympic gold-medal skip. “Hopefully Langley can follow it up next year with the same type of thing. 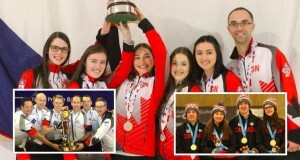 In the end, president Rick Williams of the World Financial Group expressed elation with his firm’s sponsoring involvement, both in the Continental Cup and the Canadian Seniors championship. Williams said he’s especially looking forward to the 2012 Cup renewal at Langley, B.C. Williams predicts the popularity of curling will increase in time. “I think we’ll be looking at expanding our support as a sponsoring company and to trying to bring it up to another level. 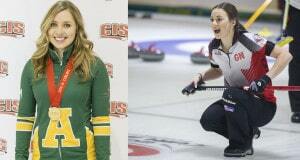 Next: Canadian Juniors only two weeks away – some words of advice.